From the release of their first No 1, West End Girls back in 1985, to their current project, remixing The Killers’ new single Read My Mind, Pet Shop Boys Neil Tennant and Chris Lowe have rarely been out of demand. The most successful pop double act in chart history, they have, over the last 21 years, not only enjoyed 20 Top Ten singles and 12 Top Ten albums, but also starred in their own movie (a surreal epic called It Shouldn’t Happen Here), written and staged a West End musical called Closer To Heaven, and scored a new soundtrack for the classic 1920 silent movie, Battleship Potemkin. Over the years, collaborations with artists such as Liza Minnelli and Dusty Springfield have ensured their general appeal, to the point that their distinctive sound, on songs such as It’s a Sin, What Have I Done to Deserve This?, Rent and this year’s I’m With Stupid  (a satirical swipe at Tony Blair’s relationship with George Bush)  are instantly recognisable. Little doubt then that their Hogmanay performance in Princes Street Gardens to see in the bells is one of the most eagerly-awaited concerts to grace the city in a decade. With a playlist comprising the duo’s greatest hits, athletic dancers, huge video screens and a dancing top hat, it is the biggest production staged as part of the Capital’s New Year celebrations. The Pet Shop Boys concert in the Gardens will follow the same format of those that have wowed the band’s fans in the States, although one or two adjustments have been made to the playlist. ‘We’ve put in a couple of new songs, taken out the old ones, and put in some faster ones. But there’ll be lots of songs that everyone knows. It will be a real party,’ says the singer, who was a frequent visitor to the Capital in his youth when he and his mates regularly made the trip north at the weekend. That was long before he met Chris Lowe, of course, a serendipitous affair in an electronics shop on London’s King’s Road in 1981 which led to the formation of the Pet Shop Boys. Nonetheless, Tennant did and the Pet Shop Boys scored their first No 1 with West End Girls in 1985. They then released three phenomenally successful albums – Please, Actually and Introspective  before heading off on their first live tour in 1989. He recalls: ‘Right from the start we liked the idea of putting on a show. We had this very ambitious idea that the two of us would do a big theatrical show because when I was at Smash Hits I went to a lot of rock gigs and was struck by the fact that they could be quite boring. We wanted to do something that kept the audience interested, and wanted to work with a theatre director, which very few bands had done, ie, having someone think about the way it would look, how it would be paced and how it would be lit. That’s what we started doing in 1989 with [film director] Derek Jarman and what we are still doing today with Es Devlin. The Boys reinvented themselves again in 1988 with their cinematic release of It Couldn’t Happen Here, and again on the West End in 2001 with Closer to Heaven. IN 1997, 13 years after they first started recording together, the double act played their first rock festival, an engagement that Tennant admits took him by surprise. 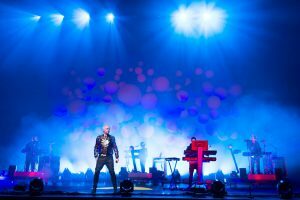 If there is any doubt that the singer has done just that, it’s worth reviewing the Pet Shop Boys’ past year  a busy one, of which the Hogmanay gig is a definite highlight. After that break, however, the singer who is proud of his name’s Edinburgh connection ’the Tennant family are from Edinburgh, it’s an Edinburgh name’,  has more than enough to keep him and Lowe busy for another 21 years. Despite his time in the business, however, Tennant’s enthusiasm remains undampened: ‘I have a lot of ambitions in terms of writing music, and in terms of collaborations,’ he reveals. ‘Doing another musical is one, although, I’m sick of the term musical because there are so many that it’s become a bit of a cliche. But we would like to do a contemporary entertainment with music and dance, something that is totally fresh. With an attitude like that it seems unlikely that the Pet Shop Boys will ever be accused of Being Boring.